My father was at Marlag & Milag Nord camp from 1939 to 1945 and I have recently obtained a postcard / photo he sent to my cousin in 1943. There are also some letters from the camp which I would be pleased to copy for you if you are interested. I have no record of a Frost in Milag, the Merchant Navy camp, so I assume your father was in the Royal Navy and in the Marlag part of the camp. where they spent six months in prison presumed dead, before returning to Britain. Peter Coe sadly died in 2008 whilst Sebastian was at the Beijing Olympic Games. Seeking information about my uncle Commander John Croasdaile Royal Navy Reserve who was captain of the British ship the “Vandyke” that was sunk duringthe battle of Narvik in 1940. He was imprisoned for 5 years at Marlag. His wife and two children were killed during his imprisonment while attempting to come to America for the remainder of the war,to join relatives here. They were aboard the “city of Benares” the last ship bringing children to Foster homes in Canada for the duration. It was torpedoed and sunk. I am doing the family genealogy book and would like to contact any that knew John in camp. I’m afraid I don’t have as much information on Marlag as I do on Milag but every thing I learn builds up a better picture that I can pass on to others. My information is that Captain G.E.Wilson R.N. D.S.O. was captain of the Vandyke but I am always willing to be corrected. reading the various posts reminds me of the stories my farther used to tell me about Sanbostal and Milag norde,especially the hospital. I have a record of a George Aitken, POW no. 89979, an Engineer from the Lustrous and who was held in barrack 15a, room 3. If that’s your father do please make contact as we may be able to swap information. Were they crewmembers/passengers of the SS Empire Ranger? I’ve visited the National Archive at KEW and and found out mr Blake missed the HMS Shika and was about to join them for the return trip but never reached them. But in his files nothing is written about the Empire Ranger? John Brown was an Assistant Steward on the Empire Ranger. He died in captivity on 26th June 1942, almost exactly 3 months from the date his ship was sunk. He was the son of John and Mary Borthwick Brown of Knightswood, Glasgow. Having spoken at length to the late Dai Lovering, who was a cabin boy on the Ranger, and who spent 12 hours sitting in a flooded lifeboat in sub zero temperatures, it is suprising that any of the Ranger’s crew survived to reach captivity. I have no information on Blake. As he missed HMS Shika, perhaps he was a DEMS (Naval Gunner) and would not have appeared on the ships Articles. I can find no record of his death in WW II. The files ( I’ve send you by mail) of Robert Blake speak about him being a steward. I couldn’t find any info in the crew arrangements of the Empire Ranger, so I hoped the BT 373/2392 of Blake would give me a clue, but it’s still not clear. According to my papers The John Brown I’m writing about is POW 1507 as John Brown of the EMpire Ranger is POW 1474.
sir, i wonder if you can give me some info on a prisoner named john keevey who was taken prisoner about 1940, he was a merchant seaman and we [my mate and i my mate is patrick keevey john,s son], originally he was told his father was sunk of the coast of ireland while seving on the ;patroclus; but i have since read that although the ;patroclus; was sunk all hands were saved, im sorry i can,t give you much info because apparently john did not talk much about his time as a pow but i can tell you he was from birkenhead, merseyside, and before the war he worked at buchanans flower mill in birkenhead, thanks for any help you can give me, regards, kevin lysaght. Kevin, I’m sorry but I dont have any record of John Keevey as a POW in the M.N.camp. The Patroclus was completed in March 1923 as steam passenger ship for Alfred Holt & Co, Liverpool. On 12 Sept 1939 she was requisitioned by the Admiralty and converted to the armed merchant cruiser HMS Patroclus until she was sunk on 2 Jan 1940. Not everyone survived the sinking of the Patroclus but the surviving 33 officers and 330 ratings from HMS Patroclus were picked up by HMS Beagle (H 30) (LtCdr R.H. Wright, RN) and landed at Greenock. The Uboat net web site lists 57 names of those who survived but Keevey’s name is not among them. From the above I think it likely that Keevey was a merchant seaman serving under a T124 Agreement in the Royal Naavy and if subsequently captured would have been treated as RN and could have been in Marlag or elsewhere. Thanks for your query. I have your father listed but as George so Ive added John to his record. He was in Barrack 12 and I have searched in case there was a Kenneth in the same barrack but no luck. Neither could I find a Ken among the crew of the Afric Star. As far as his medals are concerned, if he did not qualify for a particular medal because he hadnt got enough sea time then his capture would automatically qualify him. As a resident of Australia, The Aus authorities should be the ones to give out the medals. I cant remember which Government Department but I’m sure if you contact a Veterand association they should be able to help. In the UK the medal records and sea service records have been taken from my old office and given to the Public Records in Kew. A UK applicant now has to search or pay for a search to prove entitlement but since this shameful state of affairs came about after I retired, I dont know the arrangements for Commonwealth. hi, om looking for any info about a merchant navy seaman named john keevey from birkenhead merseyside who was taken pow in 1940 after being sunk on the patroclus [ i think] thanks for any info you can supply, regards, kevin. My father, Fred Hutson was the acting acting Royal Navy A/B gunner on the (D.E.M.S vessel ) A.D. Huff sunk by the Gneisenau in February 1941. I made initial contact with Murray Armstrong in 2005 and subsequent dialogue between him, my father and me led to my father’s story being published on http://www.murrayarmstrong.com/tm/hutson/hutson.htm which was a link within Tommy’s Log Web site. In one of Murray’s letters to my father (February 2006) he says “I understand that my friend Gabe Thomas has spoken with you recently”. The reason for making contact is that my father is still alive (now 91) and it would be a pity to leave things until a later date only to be told that it would have been very useful to you or whoever to tap into his knowledge / memories while he was still with us and maybe you might be able to tell me who would now have all the files / paperwork / documents in connection with Murray Armstrong’s work or others involved in the same field so that I and family could access the same on the Internet. 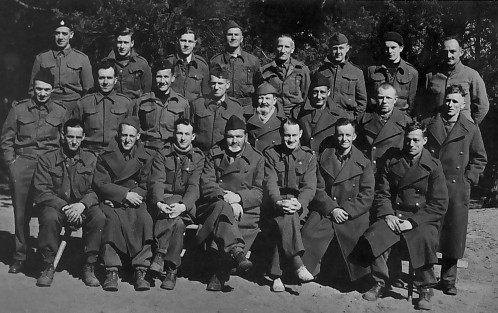 For the record I have a few hard copy items including a letter from George Shaker to my father, a print out of my father’s story on Murray’s site and a (scanned copy) group photo of my father with fellow POW’s of Bau und Arbeits Batallion 21 in Upper Silesia in1942. He was at Marlag & Milag Nord during 1941 and transfered to Silesia in ’42. P.S. Would you know if there is anyone else that was on the Huff that is still alive? Unfortunately you are correct, Murray Armstrong died unexpectedly last Autumn. I was proud to have called him a friend even though we had never met but corresponded by Email and occasional phone call. Shirley, his widow has sent me Murrays files and I am slowly getting to grips with the information he had. It wasn’t until I was reading some of his letters that I learnt that his father in law was the Tommy of Tommys Log and had been in Milag. My great grandfather Valentine Harris was kept here after the Afric Star was sunk. Having difficulty finding info on him and was wondering if you can help in any way. I appreciate the efforts made by Mr Thomas and others to provide information about the Milag & Marlag camp. My father – Donald B.L Grew (1913-1974) – was a prisoner in the camp from 1944-45. He served as a Radio Officer aboard the SS Phemius which was sunk off the west coast of Africa on 19 December 1943 by U-515. He was taken aboard U-515 and eventually ended up in Milag. Unfortunately I do not know much about his time in the camp but if anyone can provide me with any information I would be eternally grateful. My father – Donald B.L. Grew (1913-74) was a POW in Milag from 1944-45. He served as a Radio Officer aboard the SS Phemius which was sunk off the west coast of Africa on 19 December 1943. My father was taken prsioner and eventually ended up in Milag. I know little about his time in the camp so if anyone has any information that possibly relates to my father I would be very interested to hear/receive it. I am interested to know if there will be more photos, information etc added to the site. I have a barrack room photo which I would be pleased for you to add to the site if you could let me know where to email a copy. I,m collecting data and info for a documentary on the German sea raiders of WW2. My dad was made a PoW at Milag-Nord by Atlantis. Any information or leads on this subject from allied OR axis POV will be appreciated and treated with EQUAL RESPECT for the courage of the men who put their lives on hold and in harms way for their countrys. On my honor as a former United States Marine. Sempre Fi. And thank you. My grandad George Smith was a prisoner at Milag from the age of 16 to 21. He was in the Merchant Navy and was on board The Orama when it was torpedoed. Would be great if anyone has information about him. He was also held at Sandbostal before building the Milag camp. George was held at a camp near the Swiss boarder. As he was only 16 he was supposed to be sent home along with the elderly British prisoners. He was not sent home but to Sandbostal and eventually to Milag-Nord. Mum and Dad. She too was told she would be sent home. (she and her family had been living in Germany at the out break of the war). Do you know what happened to the Jewish people held in these holding camps in the earliest part of the war? Were they sent back to Britain. My Grandad is still alive and would dearly like to know what happened to Alice Mary Price. Thank you. “The 19,800 ton Orient Line troopship, Orama, had been sunk in action with the Admiral Hipper on the 8th June 1940, and two hundred and eighty of her crew taken prisoner. The prisoners were landed from a destroyer at Trondheim and held for several days in the Citadel, an old fortress, sleeping on a straw-covered concrete floor. After a rail journey of several days, travelling in cattle trucks, they arrived in Oslo to be allocated accommodation in an imposing complex of buildings occupied by the German command. Their conditions were however similar to those at Trondheim. Again their bedding was a straw-covered floor and during their three day stay here, no food was provided. On the 15th June they embarked on a British built ship, the Westsee, destination Aalborg in Denmark. Arriving at Aalborg on the 16th June they boarded a train of cattle wagons, which took them to Nuremburg, stopping en-route at Flensburg in Schelswig, for feeding and watering by the German Red Cross. On the 20th June they arrived at Nuremburg. They were housed in a separate compound in a large distribution camp recently vacated by the Hitler Youth. The seamens’ next move, was to Stalag XIIIA, an internment camp located at Wulzburg Castle at Weisenburg, just a few miles away. The castle was a medieval building built high into the hillside, and surrounded by a moat. Wulzburg castle, a PoW camp, where de Gaulle had been held during the First War, had been a mental asylum pre-war. Here they were accommodated in rooms holding some forty prisoners in three-tier bunks, the other inmates of this camp were political prisoners and British subjects who had been trapped in Germany at the outbreak of hostilities. These included staff of various British Embassies and War Graves Commission personnel. The well known harmonia player Tommy Reilly, and Giles Romilly, a Daily Express staff reporter and nephew of Winston Churchill, were amongst these “Prominente”. Also amongst this motley crew was Cecil (Vic) Hammett, the organist, who, like many other entertainers, had left it too late to leave Europe. Although my research had uncovered that British Civilians were also held in Wulzburg Castle, I have no information on any internee but I have a contact who may be able to help. Gabe, Thank you so much for your reply. I have spoken to Grandad this evening and he has explained that he was indeed an Ordinary Seaman. He had started with the Orient Line as part of the Shore Gang but could only do this from the age of 15 to 16. When he was put to sea at 16 he was made an Ordinary Seaman. Your account of what happened to the crew of the Orama matches his exactly except he was not sent to the interment camp at Wurlzberg Castle but was taken to an old college in Lake Constance. This was due to his young age. It was from here that he believed he was to be re patriated and indeed recalls that they were guarded only by police and not the German guards. It was here that he meet Alice Mary Price and her parents. There were also 300 other women being held of many different nationalities. From here he was not re patriated but sent to Tost and from there to Sandbostal and then eventually to Milag Nord. Interestingly he recalls the harmonica player Tommy Reilly and is still in contact with Bill Evens! He would love some information on the female captives of Lake Constance as he fears that perhaps Alice Mary Price may not have been re patriated either. Hi Gabe, I was wondering if you have the original file for the photo of “the smelly nelly” photograph on the website. ( The photo if the men on the toilet).My Grandad has a scrap book of photos and documents from his time at the war camp and we would like to print this photo so he can add it to his book. Thank you. Joanna.